Whether you encounter hills in training or on the race course, fighting gravity can quickly become an epic struggle both mentally and physically. However, running hills does not have to ruin your workout or race. 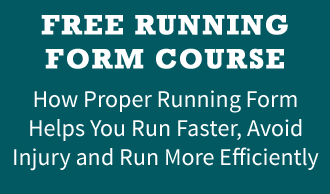 By maintaining proper form and executing a smart strategy as you run up and over them, you can actually turn hill running into a strength you can capitalize on. In this article, I am going to teach you some simple form tweaks that can save you energy and help you breeze up and over hills with greater ease. Likewise, I’ll share the secret to attacking hills during a race so you can maintain pace and stay on track to reach your goal time. Running uphill and downhill require some slight tweaks to your form to maximize your power and efficiency as well as provide you much needed oxygen. Many magazines and training partners will give you pointers on proper form, but it is important for you to understand and visualize the tips, or you could end up doing more harm than good. Here are four form suggestions and a visual for how to implement them. (2) Keep your head and eyes up, looking about 30 meters in front of you. Dropping your head restricts how much oxygen you can take in and will cause you to slouch. Likewise, drive your arms straight forward and back and use them as pistons. Your arms should form a 90-degree angle at the elbow, and swing straight back and forth, not across your body. (4) Plantar flex (point your toes towards the ground) at the ankle. Think of yourself exploding off your ankle and using that last bit of power to propel you up the hill with minimal energy expenditure. Focusing on plantar flexion can save you a lot of energy and really help you get up the hill faster and with less energy. Even though uphill running is the part that requires additional effort, having the correct downhill running technique will only help you, and can make a big difference to your performance. 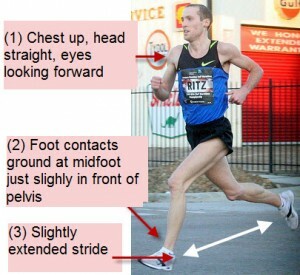 (1) Just like when running uphill, you want to have a slight lean forward at the hips to take advantage of the downhill. Don’t overdo the lean, you only need a slight tilt to benefit from gravity. Keep your arms relaxed and only slightly moving forward and back. Don’t flail them to the sides, this will waste energy. Likewise, keep your head up and your eyes looking forward. (2) Land with your foot either right beneath your torso or just slightly in front of your pelvis, depending on the grade of the downhill (the steeper the grade, the more likely your foot is to land out in front). Extending your leg too much will cause you to land on your heel, which will act like a breaking motion. Focus on landing towards your midfoot to maintain speed while staying in control. (3) Stride length should naturally extend when running downhill. However, you should not need to consciously increase your stride length. The pace and the grade of the hill will do this naturally for you. Tackling hills during races or even important workouts can be daunting. It’s easy to ruin your race by wasting too much energy grinding up a hill or fall far behind by slowing the pace too much. To handle hills effectively in races, learn to run up and down them by effort, not pace. When you approach the base of a hill, you should already have a good feel for the effort you are working at. Meaning, if you’re running goal race pace already, you should already know what that pace “feels” like. As you begin to ascend up the hill, focus on maintaining the same effort. Obviously, your actual pace will slow, even though you are running the same effort (don’t worry, you’ll make it up on the downhill). The exact time you’ll “lose” on the uphill will be a function of the steepness and length of the hill. When you crest the hill and begin the descent, simply maintain the same effort that it took to run your goal pace before you began up the hill. Contrary to running uphill, this effort will now make your actual pace faster than goal pace. For the most part, this will largely negate most of the time you lost going uphill and you’ll reach the bottom still on target (For the exact science of how much running uphill loses time versus time gained going downhill, check out the research). By maintaining a consistent effort, you won’t lose crucial energy pushing either up or down the hill. Therefore, instead of becoming an energy sapping obstacle, the hill will be just another bump in the road and you’ll be able to maintain your pace and stay strong over the remainder of the course. By improving your form and implementing this simple strategy, you’ll be able to conquer hills of all lengths and inclines. 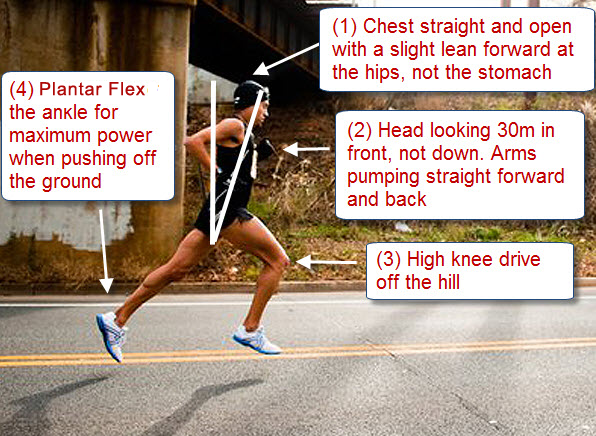 What hill running secrets do you have? Do you like hilly courses? Great advice and perfect timing. I’ve done ALL of my running in super-flat Florida, and this weekend I’m going to TN for a week, and I’ve been very nervous about the hills, having never run hills before. Thanks! Enjoy your runs in Tennessee! This was so helpful I wanted to contact you after applying your advice. I’ve started to run with a more upright and open feel up hills–it’s given me the feel of another gear! Thank you! While running a 10k ~ 5miles on flat surface, mile 6 was a fairly long hill. Shortly after approaching hill, I felt sick and had to upchuck…. Went off to side, started walking then was able to run at top of hill. A week later, same exact thing occurred. Any idea what’s going on? Pingback: Running up hills | It's Time To Start Running! I wonder how a sixty years old man can run efficiently ? and with what proper training ? many advices are targeting for your man only. Hi, I’m training for a race on the Tourmalet mountain in France this summer. It’s strictly uphill, 18km at average of 8% with the finish at 2115m (total climb 1400m). Any advice on how to train for this specifically? Thanks for this Jeff. I finished first across the Auckland Hill Freedom climb (www.freedomclimb.net.nz) 2 weeks ago and while thrilled, have been suffering from heel-strike. Now I know how to handle it better and can’t wait to give it a fresh go on Saturday! Cheers! three years ago I did the San Francisco Nike Half Marathon. I do not consider myself a “runner” and would appreciate it if some of your commentary would address the of us who enjoy competing at a different level. My rule is: Run when you can and walk when you have to. When I walk I do an official Race Walk style and find it serves me well. Even though in the higher age groups, I have to compete against runners who may be as much as 10 years younger than me. Here’s my question: There was one hill on that San Francisco race that was so steep that I couldn’t slow myself down. After plodding my way up, I was so happy to start that down grade, but quickly realized that I couldn’t control my speed and was right at the verge of falling. The course was too crowded for me to attempt to tack my way down. The only thing to do was to keep running and hope my tired legs could keep up. Luckily I made it without falling, but nowhere in your two articles do you address running down a steep hill.